LET'S ROLL - 3 Bikes 6 People (Avenger, Unicorn & FZ). Near Shahpur Rahul asked us to move on and he will join us after refueling. 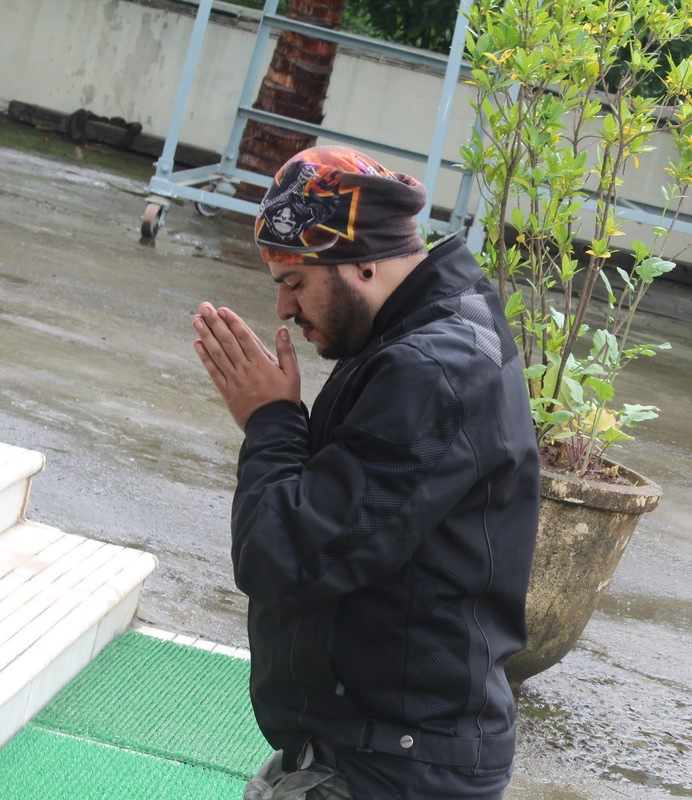 Kapil said "jab tak chal yaar Shahpur Gurdwara chalke bahar se hi matha tek dete hai". 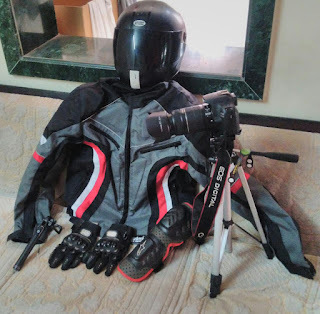 After clicking few snaps we left. 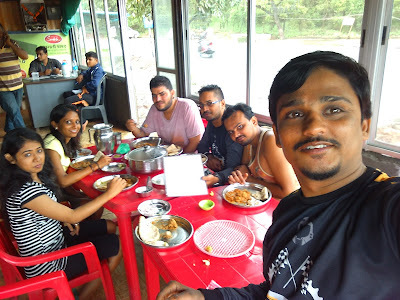 Delayed raised level of hunger so much that we took breakfast halt at entrance of Kasara Ghat instead of Igatpuri. 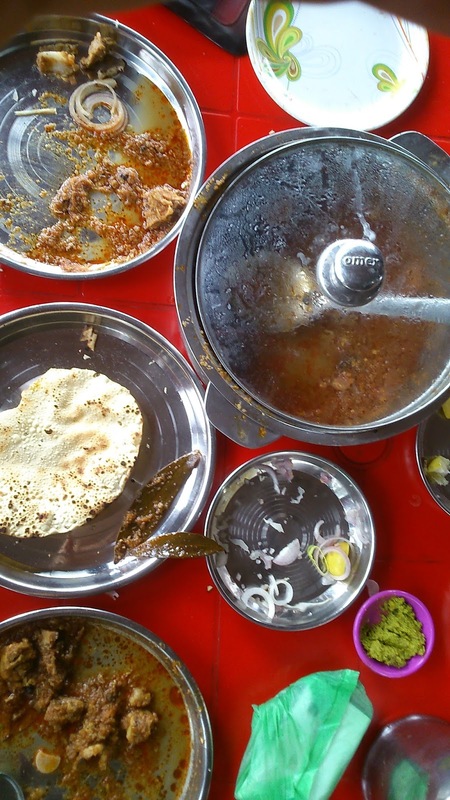 Breakfast at Baba da Dhaba, vada-pav was stuffed with huge amount of potatoes (esa laga aloo meh vada ghusa hai). While crossing the road we were astounded to catch "Hero - NAVI" in act, The guy was riding with couple of KTM-Dukes.. it was really a dare thing for NAVI to keep up with these kind of bikes. Suddenly we heard wroommm wroommmm of 1 beast "Kawasaki - Z800" with Low couple of CBR 250 they took halt few blocks away frm this dhaba and we were surprise to see a group of scooties too. Tummy was almost full with vada-pav, glass of tea & by watching bikers. Ganpati Bappa Morya (Rahul;'s Visarjan). Breathtaking Background...A must halt for travelers. crazy stuff "how about keeping 2 chilled Beer Cans in my riding jacket's inner pockets". 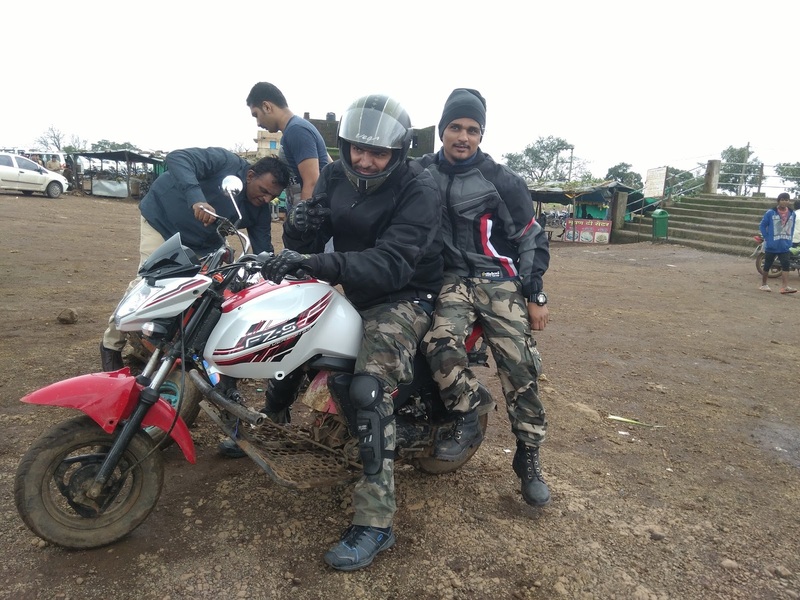 Idea really worked and we cleared Nashik and routed to dindori road after few kilometers we were accompanied by cool breezes, clouds, drizzling. 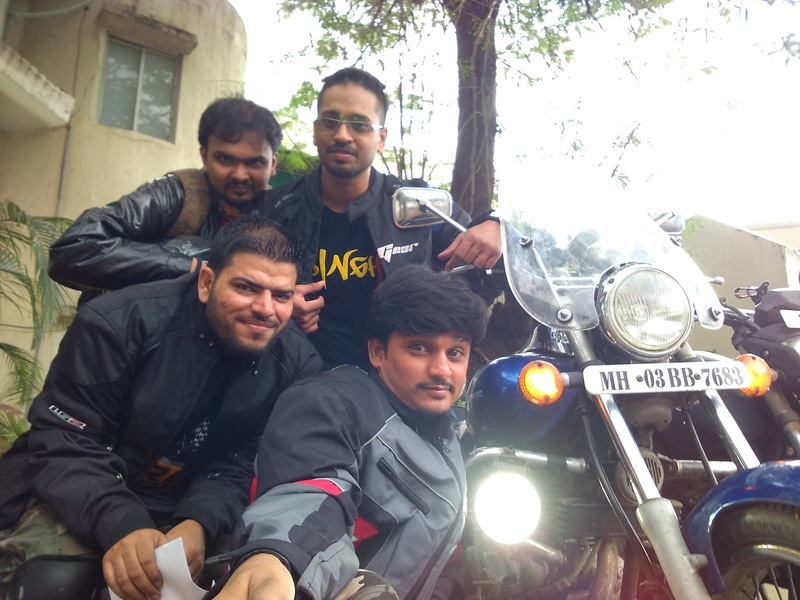 We entered hilly region it was getting darker and climate was so perfect for riding. We took 1 Sutta & Bio-break halt and after that we rode all the way to Destination. Sloop & Inclined, Grape Farms, Ponds, cattle worked as refreshing inhaler last but not least scenic resorts on the right. Keeping an eye on "pygmy little white n green rock" called Milestone was increasing our excitement after every 2-3 minutes distance of Saputara was reducing. Finally we saw a board "Gujarat State Limit starts here" followed by a board at 10 steps "Welcome to Saputara". 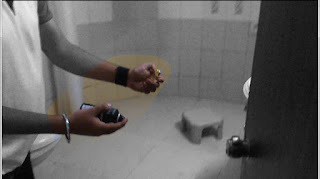 (Don't forget to Watch footage captured by Kapil). Check the hotel name...almost invisible due to fog. 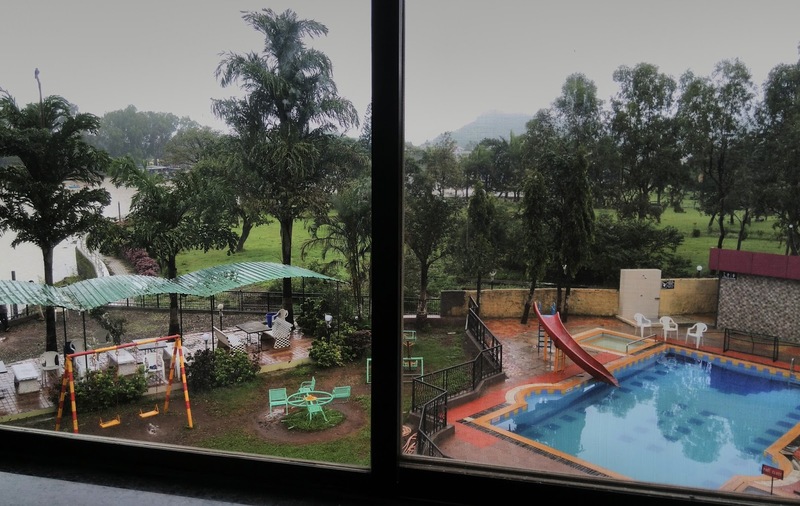 Harmeet recalled his memory and without taking any halt we entered "Savshanti Lake Resort", it's the only resort kissing the lake. Lake was surrounded by dense fog. Finally we parked our triple glory machines, We were the only bikers in that resort, parking was lined up with SUV & Sedan of GJ registration. Watching Rider in Riding Jackets & Pillions wearing helmets & shoes stole heart of Reception & Staff of Resort. 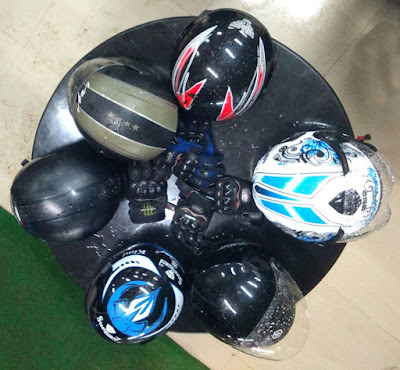 It was 2:30 and after doing check in documentation we unarmed ourselves just like "King Leonidas from climax scene of movie 300, got rid of shield, spear and helmet". After changing we decided to hunt our prey as tummy was starving for lunch. Patel's Chicken Handi....slighty sweet but not so spicy. Dipika "the gujju grl" saw a sign board which was beyond our brains (hahaha it was printed in Gujarati) Patel's Dhaba...She recommended trust me guys u gonna enjoy the food over here. We said yeah!! we are so hungry that we can swallow a goat. As she said lunch was yummy gravy & patel special chatni (Ungliyaan hi chaat te rehjaoge). Dipika was having conversation with Dhaba guys in local language and we were pulling her leg after each line. Kapil: Kisi gusse meh aye hue punjabi ke haath ki maar khai hai? wo marne ke baad bhi yaad rahe gi. Clicked few selfies & after paying bill we stood by a fountain circle near resort. At last Akil got in. It was time for DSLR Showtime baby... Akil took everyone by surprise he unleashed his photography talent which most of TRC folks were not aware of then Rahul & Akil framed few hilarious scenes near fountain. Time was 5:30pm, we got back to our rooms and planned to visit Governor Hill which was covered with fog and we all were curious about Rope-way but boys wanted to get down to swimming pool under chilled climate, girls heart were broken they were waiting fully prepared for photo shoot at governor hill and were covered in glossy makeup & hot outfits then after yelling at us they went back and returned to pool in wet weather dress. View from Resort...Sorry Folks check out our footage for water-sports. Dipika's dive splits the love birds. Dipika was shivering so much coz water was very cold and winds were strong. We tried all sorts of water stunts. Pool shutdown time was 7pm and show was about to end. We ordered tea just to give a cosy feel. We had our evening tea under roof & raw rocky seats which were close to lake. "SHAAM KA PYALA YAARO KE NAAM" We told everyone after an hour we will start up with boozing. Kapil & Akil decided to stay in room they were playing card game. Rahul, Sanya, Dipika & Harmeet went to grab cold drinks and chakna. (Kapil need painkiller, Akil asked for Cold n Flu) We placed order of 2 types of starters from 2 different Dhaba. Harmeet was already suffering from soar throat from last 3 days. We went to Government Hospital and collected cure for all. Kapil targeted Dipika and we executed a game. Dipika was tricked by mastermind Kapil. Sanya was uncontrollable while laughing, she was tumbling in many instances. -Harmeet, Rahul & Akil were enjoying whatever was happening around. SAPUTARANORMAL ACTIVITY Dipika took a raw shot of vodka and she was totalled, Sleeping early is not an option for us. 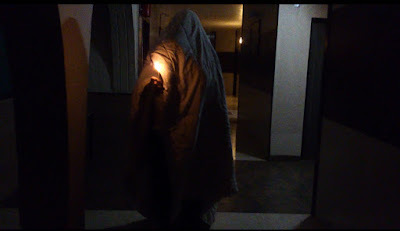 We Scared devil out of Sanya, Kapil was ready with spooky outfit, he wrapped white bed sheet around him and he was also holding a lighted candle. Harmeet was giving weird background voices by capturing video along with Akil. (Checkout the footage, we assure you that it's more scary than the Conjuring) We continued our freak out & crazy acts till 3:30 am. We are so tired and some of us are awake since Friday let's go to sleep. Morning Mist.... Harmeet was the first person to get up early at 9am. After 90 minutes we were ready with our bag packs for check out. 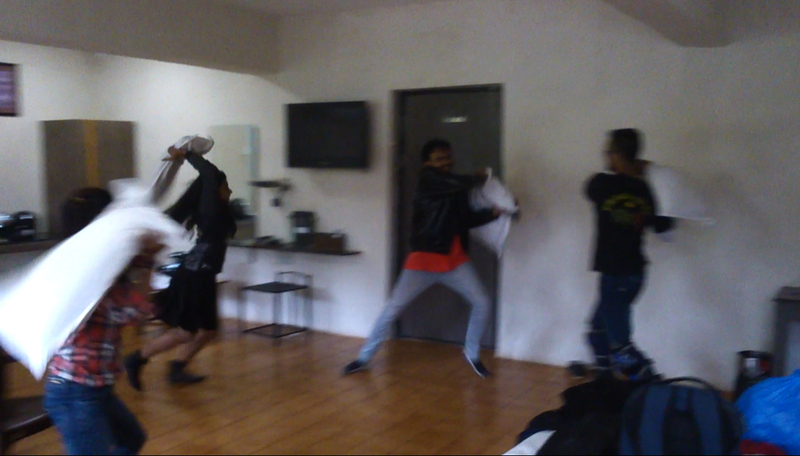 We grabbed pillows and started oh yeahhh pillow fight... This was basically a warm up .hahahaha..We calculated and shared total expenditure. Parking with Gujarati Patakasss......Final Glimpse of resort and we headed towards our desirable spot "Governor Hill". Extreme Low rides (modified bikes), Camel Ride, Ropeway, Snake Charmer, Corns...40 degree Incline (the last turn) is a real challenge if you wanna hit the surface with sunday's rush. Thank God roads were flat and smooth. "CAR WALE TO BHAGWAN BHAROSE" hahahaa..
TRC was center of attraction wherever they went. 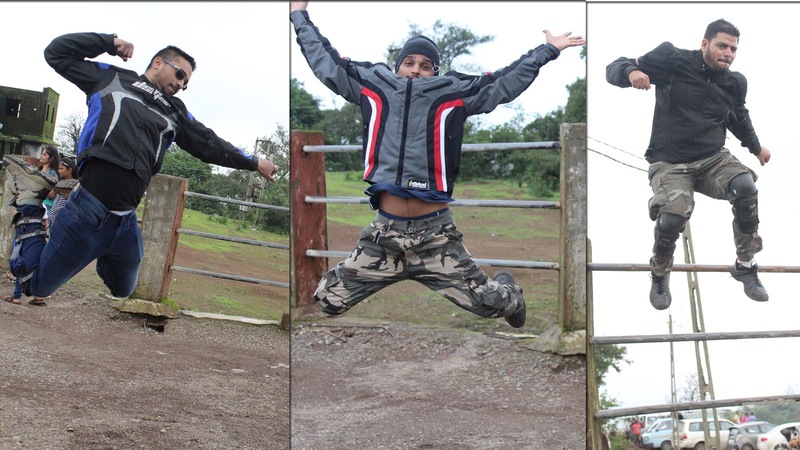 Saputara View Point was our main catch, Harmeet's Super Jump, Kapil's Sholay jump and Dipika & Sanya's Tata Tea Jump. Rahul & Akil were deeply focusing on capturing every moment. We tried Nagin dance with "SAPERA", Harmeet ne Kapil ko bola apni belt nikal ke fekde aur chila saap...public bhaag jaygi. Tummy was knocking continuously, it was time for breakfast, we went down to street stalls near lake. we were placing order...wait a minute it's afternoon guys 2 bajgaya...pagal hai kya direct khana khate hai. Hey One last spot!!! how can we miss Honey bee center? ..Trust me fellas if you want raw and pure honey without any artificial preservatives then do visit this place. Are you fan of Fear Factor? Khatron ke Khiladi then you can definitely try this.....Holding Biggy Honey Bees, don't drop it otherwise you are good as dead. 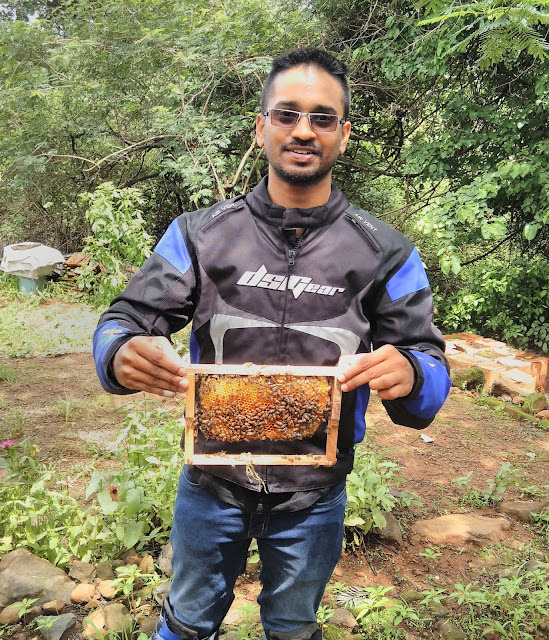 1 Pint of Honey costs around Rs. 180, (ayurvedic papad n chikkis are also available). Hurry up...bhukk lag hai bahot.....we had our lunch at Karnataka Dhaba....There is one good thing about Dhaba's of Saputara, you will feel as if you are having meals at home. Home made chapattis and gravy free from baking soda which most of the highway dhaba wala uses. We were already 3 hrs behind our schedule. It was 3:35pm and We gave flying kiss to SAPUTARA. 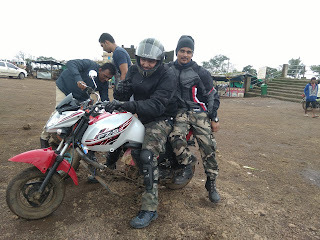 Plan was to halt directly in Igatpuri for Tea break but after crossing dindori road and just before nashik we decided to refuel our bikes and ourselves with Petrol & Tea. There we started discussing about Rahul & Sanya's wedding....then we realized it's getting late. 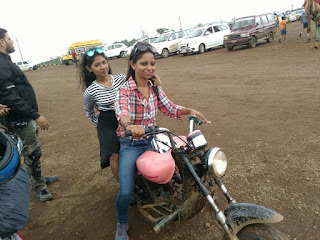 Nashik road was still dry...We asked locals to guide us with traffic free route which can lead us to highway.. Yeah baby home stretch.......Highway is our way, it's time to unleash the beast. 80km/hr and we covered a decent distance in couple of hours. Before hitting Igatpuri we were chased by dark clouds, it started raining heavily visibility was very low. We took bio break at Hotel Kamath and idea was to sip a coffee than move. Hotel service was very poor it caused us serious time. 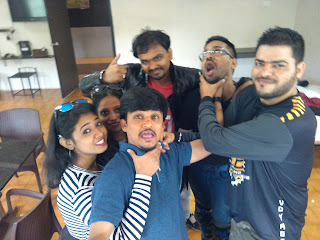 They gave 6 cup of coffee after 30 minutes, We can't live with just coffee it was almost dark and we started eating vadapav..
Time ka pata hi nahi chala yaaar hadd hi hogayi 8 baj gaye....Ghar pe bolke aaye the 5 ya 7 baje tak shaam ko ghar pahuch jayenge. SELF MARO BIKE NIKALAO YAHA SE..... 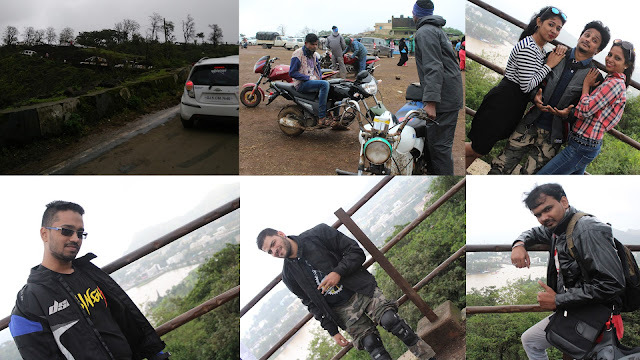 It was still raining heavily and after few miles just before Kasara Ghat I saw a familiar face and heard a voice "Harmeet" "Harmeet"... Areh yeh to Nilesh bhai hai Flying Squad ke Admin. They were returning from Ashoka-Vihigaon Waterfalls. Nilesh bhai asked to collaborate ride with them till Kalyan-Bhiwandi Bypass. After discussion with team we said Of course, let's do it. Kasara ghat was surrounded by complete darkness & deadly curves. With 1 sutta and head count halt we reached Bypass around 11 and Rahul & Sanya dispersed at Kharegoan-Kalwa toll. We dropped Akil at Airoli and 3 of us left for Chembur & Sion....After Crossing Vikroli Harmeet heard noises from rear end of his avenger...takk tak.. khat... I told just let it go will see tomorrow...We waved our hand and it was time to say goodbye to Kapil. Dropped Dipika near her home and finally reched home. 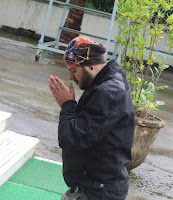 After hitting the bell, Mom open up I am back....Itna late aya gharpe , kisne bola Gujarat jaane, Waterfall Mumbai ke pass kitne hai yaha jaane nahi hua....hahaha At this moment Scoldings were like flies around bread jam, u know u have been through heaven. DELAYS OCCUR EVERY NOW & THEN BUT MOST IMPORTANT THING IS EACH & EVERY WAS WORTH IT...."Ja Simran Jee Leh APni Jindagi- DDLJ" It was truly a mesmerizing trip. Make up your mind for One Day Monsoon Ride-2 which will be conducted on 21st August (Destination "Malshej Ghat). So plan time for your family and household works on festival day. Please keep Sunday reserved for Ride as festivals are not falling on ride day.